Clayton's Kola Tonic have just under a week to get themselves fighting fit as they will be spending most of the time licking their wounds after a rather embarrassing loss in the Barbados Premier League. Playing in the Sunday's nightcap at the Wildey Turf, the Dames seem bound for relegation after the Barbados Defence Force Sports Programme handed down a 12-0 lashing which saw them bumbling to their seventh loss of the season. The floodgates were opened in the second minute of the game with a goal from Antonio Arthur and it was all downhill from there. Omani Leacock ran off with the Player of the Match award after ending with a hat-trick form goals in the 23rd, 30th and 39th minutes. His feat was punctuated by a goal from Renaldo Trim in the 34th to see the soldiers to the 5-0 lead at the break. So overwhelming was the sting of the first five, that goalkeeper Shakib Kellman called for a substitution during the break to see young Tyrique Chase put on the gloves for the second half. Going the other way, even more goals would come and Rashad Smith got the ball rolling in the 50th. Just two minutes after, an own-goal from Winston Maynard brought the scoreline to 7-0. Raheim Sargeant got himself into the game with a brace in the 60th and 75th minutes. National team Captain, Rashad Jules, got himself on the car between Sargeant's goals when he found the nets in the 67th. Young forward Rasheed Williams drove the final nails in the coffin off the bench as he beat the new keeper in the 77th and 84th minutes. The evening got underway with Paradise FC taking a 2-0 over the University of the West Indies Blackbirds to bounce back from a loss in their last game. National player Ackeel Applewhaite opened their account in the 5th minute of the game. Things would go from bad to worse as UWI were at an early disadvantage when they lost the services of Shamari Mark in the 11th minute. 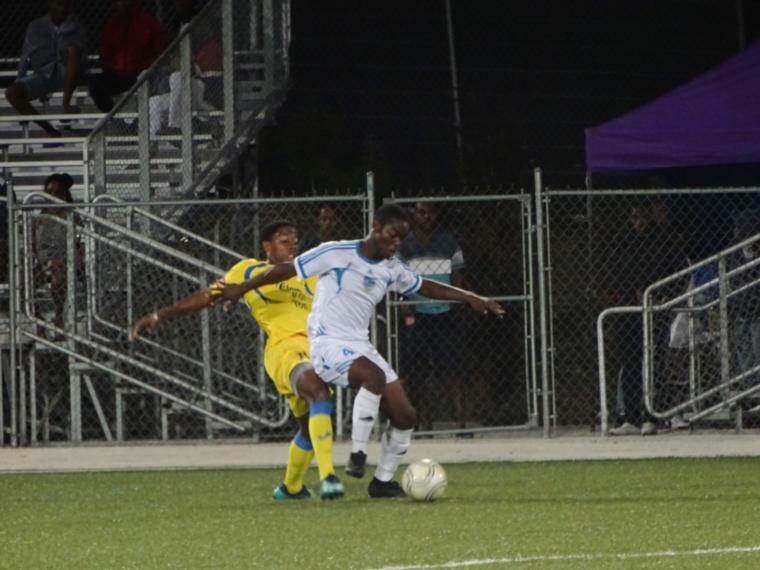 In the second half, both teams were docked a man in the 65th minute when UWI's Damien Small and Paradise's Mario Williams were both issued red cards for an on-field altercation. Jomo Harris was solid in the midfield for Paradise and put the ball in the nets against his former team in the 88th to seal the deal. The middle game saw Weymouth Wales taking an expected 3-0 victory over Youth Milan. Romario Harewood knocked the first goal past Shaquille Frank in the 21st minute and made it look easy as he came down the left and blasted the ball to the far post to the left of the diving custodian. The score stood at 2-0 not too long after as an unattended Shaquille Boyce was fed the ball in the penalty area by Kemar Headley. A massive defensive blunder gave Wales their third goal late in the game and Headley was the man to put his name on it. A long ball in from the back by Akeem Maloney intended for Headley was intercepted by Shamar Atkinson before falling to Jason Gilkes. Gilkes' first touch was flawed and the ball ended up heading into the box and leaving Headley alone with an advancing Frank. Headley made it to the ball first and ran to his left to leave Frank scrambling before he easily slotted home.